This year’s San Francisco International Film Festival closed Thursday night with the local premiere of Michael Almereyda’s Experimenter–a biopic about social psychologist Stanley Milgram, whose controversial experiments examined how we react when our empathy conflicts with our obedience to authority. Speaking of authority figures, when we entered the Castro Theatre, we found almost all of the seats had "Reserved" signs on them, as they had on opening night. Only a few rows at the front and back of the theater were available for regular people. The opening talks lasted a little under half an hour. Festival Executive Director Noah Cowan, Director of Programming Rachel Rosen, and the film’s writer/director, Michael Almereyda, came up in turns and thanked companies, organizations, and people. And then the movie began. Experimenter is slated for a theatrical release, so I can only give you a paragraph about the movie. 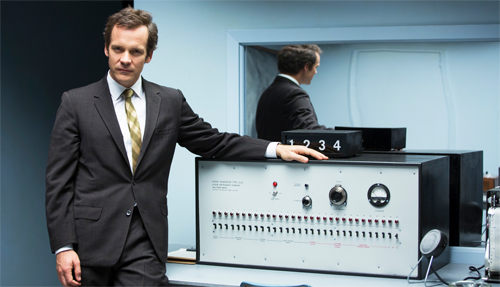 In the early ’60s, Stanley Milgram (Peter Sarsgaard) ran tests that tricked subjects into thinking they were torturing someone. He wanted to see how many would stop when ordered to keep going. His methods were extremely controversial. Almereyda, who clearly sides with Milgram in the controversy, finds unique and entertaining ways to tell the story, such ashaving Sarsgaard talk directly to the camera, and occasionally using obviously fake backgrounds. The acting is mostly excellent, and the subject matter is just plain fascinating. Winona Ryder plays Milgram’s wife. I’m giving it an A-. On how Milgram’s book insired Almereyda to make the movie: "The dialog [in the book] was complicated and profound. As you read it, you realize the depth of his interest." Almereyda admitted that Elms "corrected some really stupid mistakes" in the script, including having to remind the auteur that Milgram didn’t smoke. On his unusual narration technique: "The whole idea of talking to the camera didn’t come from House of Cards, but from [Milgram’s] own movies." Ryder, when asked about playing someone who is still alive: "It was important for this particular story and Michael’s vision [that we] get approval. i was quite nervous, but as soon as I met her she has such an incredible grace." I asked about two scenes where, for no apparent reason, an elephant walked behind Sarsgaard as he talked to the camera. Almereyda and Ryder told us the elephant’s name, and that she made every one on the set happy. But they didn’t give me a serious answer. "We had 20 days to shoot this movie. we didn’t have time for fooling around." After the Q&A, I went to the Closing Night Party at the Mezzanine. The music was enjoyable and loud, but not too loud. I could wander comfortably and talk to people. I had a good time.